Here's some gif animation to show what I meant. Some big improvement then. I think you may crack the problem with some more testing. Have you tried different speeds in the tablet serial port? You can set these using the UDconfig tool. Also the Wacom drivers have different read modes, might be worth fiddling with. will try that. thanks Drew. That's a good improvement with the jittering .... what are you shielding and how? Rumi, first I protect the vertical and horizontal circuit that "stick" on the side of the LCD with cling film. 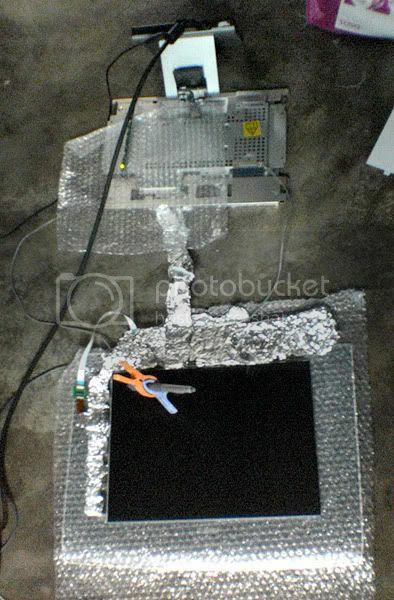 Than I warp the whole circuit with aluminium foil. I also use the foil on the extended signal cable that lead to the main circuit. For the main circuit unit, I attach it back to the metal peice that it came with in the monitor. I will post a photo i took later, forgot to transfer it yesterday. Did you earth that foil as well? If not that might make it more effective. All i did was connect the foil to the metal sheet where the main circuit located. Let's say to earth it, I just have to link it up to the earth pin of my wall socket right? not much difference if I earth it. here's the picture of my test setup. Looks like some kind of NASA thing ! Well it looks like you should just keep on adding Shielding. You need to make sure there are no gaps in your sheilding at all or it will escape. Fortunatly my LCD produces nothing, Ive tested it out only with my smaller A6 tablet, I think there may be some random left clicking but thats probably just me pressing down. The Screen is/was a Compaq1501 I highly recommened it. Maybe save yourself some time and get one off ebay? That's great Wei, I will have to try that! Did you extend your backlight cables? They look quite long. Rumi, I'm yet to extend the CCFL cable. Those two cable are connecting the foil to the metal sheet. Testing to see if that help. Apparently it does nothing. You should test on yours too, see if we could come out with a solution. Still no hope, even trying what Rumi did, warping the tablet inactive area. I think i will put the LCD aside and start looking for a new screen. Can you put name rank and serial number on the "bad monitors" list please.